Design sensitivity was imperative when considering the function of the space and very much influenced the final form. Having a clear understanding of the client’s needs on a day to day basis and moreover the needs of visiting patients, meant practical issues were also of high importance. The way in which the geometry circulates and unfolds not only promotes an atmosphere of calm, rest and relaxation but in severe circumstances, also prevents children from harming themselves on corners: where this space is concerned, right angles are most definitely the wrong angles. 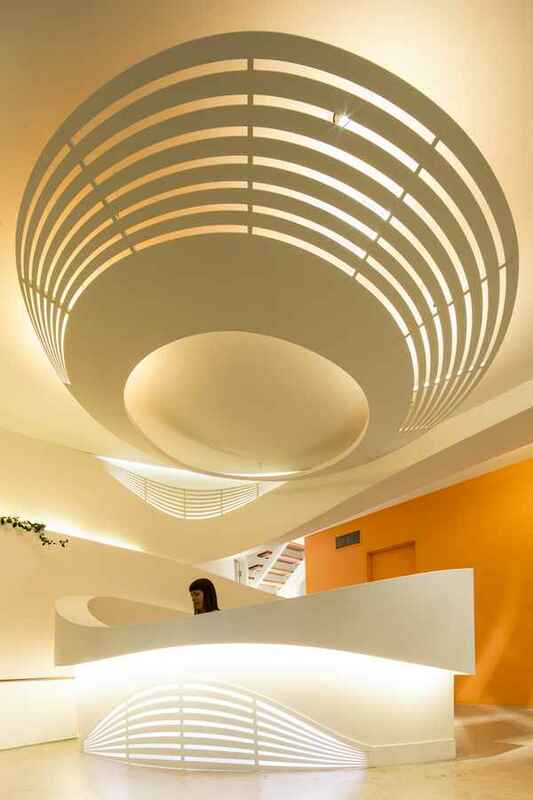 The partnership of light, optics & colour also played a pivotal role in shaping the overall feel of the project. Indirect lighting was used to soften the space with cove lighting providing an additional calming effect. Colours play an important role in shaping our emotions and with this in mind, a fresh & neutral base pallet was chosen with bold colour injections interspersed throughout. Known for its healing properties, a fearless orange shade was chosen for the back feature wall. Soft furnishings complemented the colour scheme with playful Dinosaur design rugs and Fiocco “stocking” chairs by Busnelli.